Horizontal boring machines are used to install pipes and conduits into the ground under objects that are too expensive to dig up and replace. For homeowners, boring under a sidewalk or driveway for landscape irrigation lines or underground electrical conduit is much less expensive than tearing out and replacing a section of pavement. Simple horizontal boring is accomplished via hydrostatic pressure, or the force of water from a hose or pressurized water source. A simple garden hose can easily be used as a horizontal boring device. 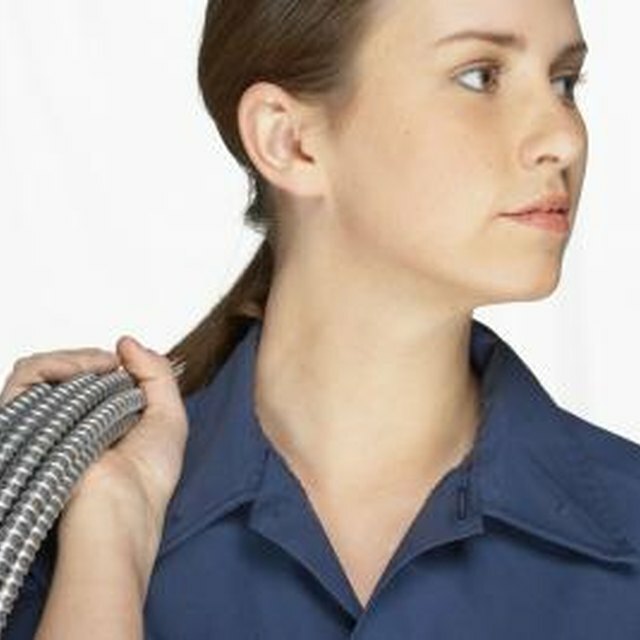 Attach a 3-foot to 4-foot length of steel pipe to the end of a garden hose or trash pump discharge hose with duct tape. Pick a pipe long enough to extend the entire distance of the horizontal boring operation. Hand-dig a trench on both sides of the concrete slab that extends 6 inches to 8 inches below the bottom edge of the cement pad. The metal pipe should be able to lay flat in the trench, parallel to the top of the cement pad. Turn on the water or start up the trash pump so that pressurized water flows from the end of the metal pipe. Push the pipe into the earth under the cement pad. As the pipe is pushed forward, the water pressure will bore a hole though the earth and send the debris back toward you. The process is quite messy and your trench will quickly turn into a mud hole. Continue pushing the pipe into the hole until the leading edge of the pipe emerges from the earth into the trench you dug on the other side of the cement pad or driveway. As you pull the metal boring pipe out of the earth, insert a piece of PVC pipe into the bored hole immediately. The PVC pipe will create a stable passage through the ground, and you can use the pipe as a conduit. As the ground dries, it will dry around the pipe, and the bored hole will remain open.